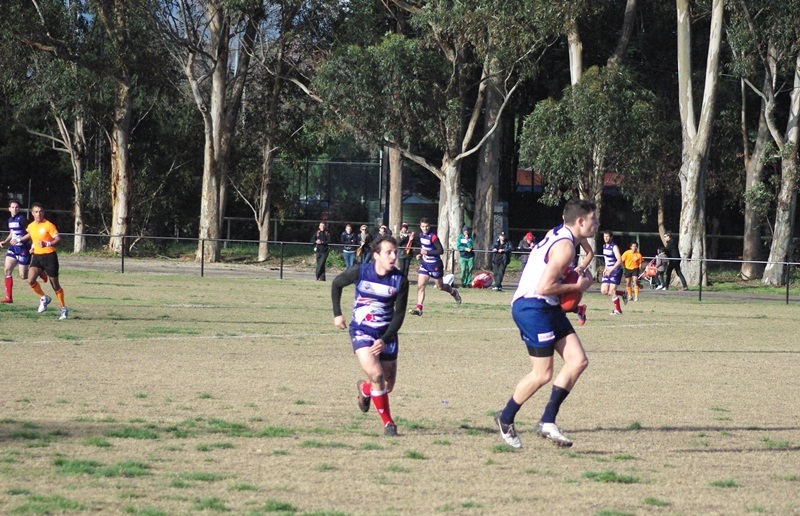 The cold Melbourne August wind seemed to claim another victim, as the French Coqs went down, comprehensively beaten by the British Bulldogs, in a conflict which in more military forms went back to the 100 years war in the middle ages. 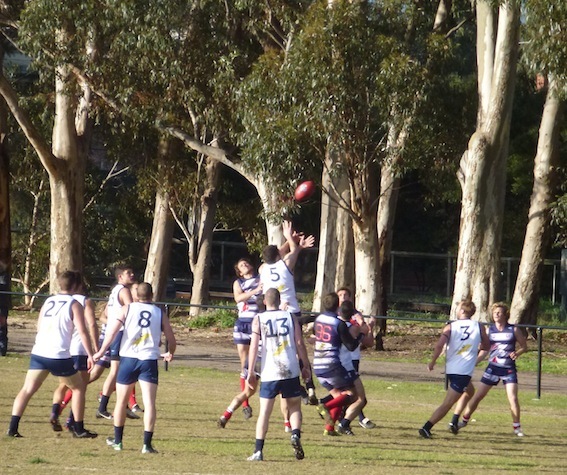 There were scuffles, though the umpires did a brilliant job of quickly extinguishing potential spot fires with free kicks, something which might happen more in the AFL. In this battle between the teams, the difference between the forces could have been predicted by the stat sheet. The Brits had two players nearing Sandilands height, of over 200 cms, and another four who were 190 cms or more; the French only two of the latter. Similarly, when it came to high level experience the Brits had at least 11 players currently playing in Australia, while the French had only three playing in Australia. In weight, too, there was a difference: only three French list players over 90 kgs compared to 10 on the Bulldogs’ list. Despite the French coming second in the Euro Cup in 2013, and the number of French players from the Toulouse Hawks in that southern rugby town, auguring well for tackling skills, there was a gap between the teams. 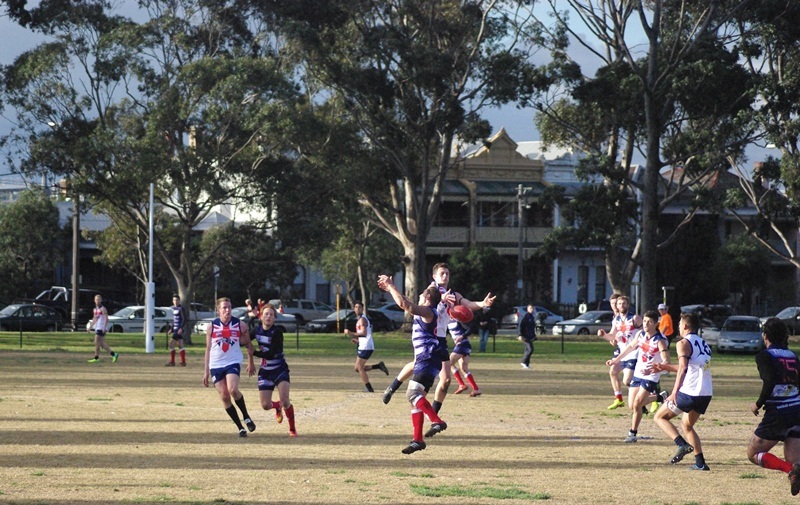 The Bulldogs established their ascendancy early with 5 goals in the first quarter and 3 more in the second, while the French had difficulty in troubling the scorers. While the game was one sided from the early stages, at different times the French matched the Brits (who included the giant full forward Sam Pitman), the French were competitive. In fact, they had more possession of the ball as the game went on, and used the ball more convincingly – perhaps the opening game of an International Cup has more butterflies than we have so far realised. As in several other games, including Pakistan vs South Africa and Japan vs PNG, the losing team had a lot more of the ball than the scores indicated. However, in different ways they lacked the physical strength, or the footy skills, or the confidence, to post some majors on the scoreboard. The rising interest in the International Cup was apparent in the big crowd, which braved the brass monkey weather, despite the consolation of sunny moments. Some of the action happened off the field. The French had several junior francais who had their own colourful dances, and the chant ‘Allez la France!’, while the Brits had one distinctive boundary line cheer squad, with its own Glaswegian banner about Sam Pitman; they also tried to convince me to add stories about his role in the team off the field, as well as other general stories on how ‘abstinence is good for footy’. The Bulldogs ran out comfortable winners, 12.17 (89) d France 1.1 (7), raising again the complex question of whether multiple divisions should run through the comp rather than only in the later stages.